While no two churches will be exactly alike, there are some trends in church design that become common enough that we take notice—and we think you should, too. 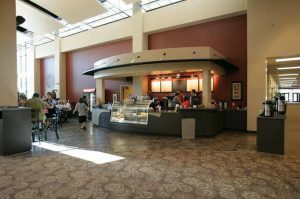 As we continue to show examples of these trends, we focus on cafés, which have become one of the most universal features that we see in churches today. Of course, with every church design trend there are some caveats. In this case, it’s about the scope and type of café. Historically, church cafés have their roots in “coffee hour” or “coffee fellowship.” Basically, a church gave away free brewed coffee and maybe some snacks to encourage people to stay around after worship and get to know each other. Some of today’s cafés do look like those historic coffee hour set-ups, but other churches have taken the trend much farther. 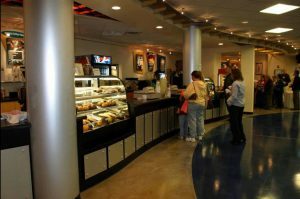 Many, today, have a full-service café, complete with smoothies, lattes, espressos, and snacks for sale. 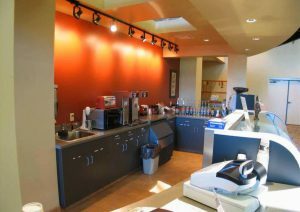 You can see a photo of this type of café from Grove City Church of the Nazarene. People feel very much at home in a café like this because it’s much like the coffee shops they visit in other parts of town. It’s very important to understand that a full-service café is a big financial decision. As shown in these detailed photos of the one at NewPointe Community Church, there’s a lot to handle. These cafés require staff, and the cost of additional employees in the budget. Even if you’re able to use volunteers from your church to run the café, they still need to be trained, and vetted to handle money. You’ll need to put procedures in place, obtain additional insurance—there’s a lot involved. Some churches decide that this level of cost and complexity is worth the investment. Often, they’re looking to draw people in from the community, or they’re wanting to help members connect around discipleship and activities that are happening in the church. If your church decides this is trend worth pursuing, the important thing is to do your research thoroughly and your calculations carefully. Know what you’re getting into before including a full-service café in your church design. Don’t worry, though. If you decide that your church can’t embrace a full-service café, this doesn’t mean you can’t still participate in this almost ubiquitous church building trend. Instead, return in spirit to the historic idea of the coffee hour and bring it up to date. We’ve drawn up many designs—for churches great and small—that include large coffee islands, where free coffee pods are set out for free brewed coffee. In this way, you can promote coffee and conversation without having to invest in cash registers and training for employees or volunteers. All church building trends have a life cycle, which is why we want to keep you up-to-date with the latest in church design. To learn more about what’s brewing(!) in churches today, sign up for our free i3 webinars.